Our developmentally and age appropriate curriculum is designed based on the principal of children’s exploration, hands-on experiences and events in their life. Play is the work of the children. Through play, children are engaged in voluntary, purposeful and spontaneously activities. Each child will be allowed to progress at his or her own pace. We will also look into their stages of development to enhance and enrich their learning opportunities. KinderStars Academy does this by providing learning opportunities both inside and outside the classroom throughout a day. Our curriculum for the toddlers/children (18 months to Kindergarten 2) is based on the Multiple Intelligence (MI) philosophy (by Dr Howard Gardner-1983) as well as the Montessori approach – Sensorial Development and Practical Life. 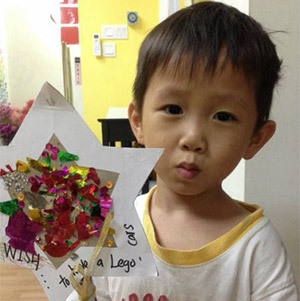 Preschoolers are naturally wonderful at asking questions about the world around them. Our well planned science activities and experiments for preschoolers give young minds the skills they need to seek answers and view the world scientifically. Projects can include simple demonstrations, craft projects like building a tin can telephone, and other science projects like sorting and categorizing things found in nature. In our cookery sessions, our children have the opportunity to experience hands-on basic cooking skills and learn about nutrition and the importance of a balance diet. They also learn team spirit in a fun way as they “work” and learn in a team of four to six. Start the day with easy, fun movement exercises can help young children become more fit. Classics with a morning theme set the stage for clapping, skipping, stretching, sit-ups and more. Children from 4 to 9 years old benefit most from speech and drama classes as they are generally able to express themselves without being too self-conscious or worried about saying the ‘wrong’ things. They are able to absorb and develop dramatic experience readily as there is no pressure to perform at that age range. Furthermore, they are also at the age where pretending is almost a daily activity when they play with their toys and when they listen to stories. 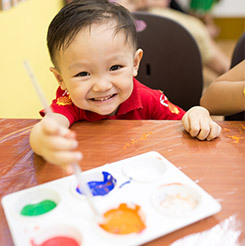 Hands-on experiences such as painting, scribbling, pasting and coloring are great media for free expression. In the “process”, children benefit richly as they discover mystery, creativity and joy. Research findings suggest that teachers and caregivers, as well as parents, use interaction styles that elicit important personality traits in infants and young children. The best forms of character education also involve students in honest, thoughtful discussion and reflection regarding the moral implications of what they see around them, what they are told, and what they personally do and experience. Unlike the traditional Chinese/Japanese abacus system which uses 4+1 Bead system. 9Beads system is based on 9 Bead System( 9′s Complement). It is the simplest abacus system in the world with only two main sets of formula which even kindergarten students can learn at ease. 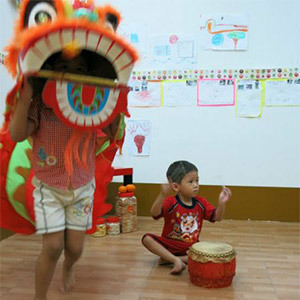 Creative learning games and activities are fun for children which can also entertain and stimulate them. The exercises for Practical Life are designed to teach the child to function in his home environment by teaching him how to cope with things around him while at the same time developing concentration, independence, cognitive order, self discipline and fine motor skills in preparation for writing. It also provides the link between home and school. We visit places of interests as well as make field trips to enhance classroom experiences. The sensitive period for Language learning occurs between 2 to 7 years old. In our classroom we encourage and emphasize speaking in English as the foundation of linguistic expressions. The child is introduced to phonetic sounds, begins reading simple words and progresses to sentence building and composition. Reading and writing skills are often acquired seemingly and spontaneously. Singing and playing music to your child has shown to be beneficial to a baby’s brain development. Thus opportunities are given to our KinderKids to appreciate music and rhythm through different types of instruments, songs and creative movements.